Home Date Interview Questions Difficult Date Questions How to find number of weeks between two given dates in Java? Write a program in Java that prints number of weeks between two given dates. For finding number of weeks between two dates, first we have to find total number of days. As we know that 1 week = 7 days, so number of weeks = (total number of days)/7. How to find number of days between two given dates? * @problem Number of weeks between two given dates. * by step we are converting. Output - How to find number of weeks between two given dates in Java? 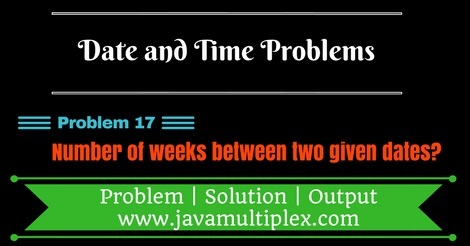 Tags : Date and Time problems, Weeks between two dates in Java, Solution in Java, DateFormat, SimpleDateFormat, String, Regular expressions, if else statement.